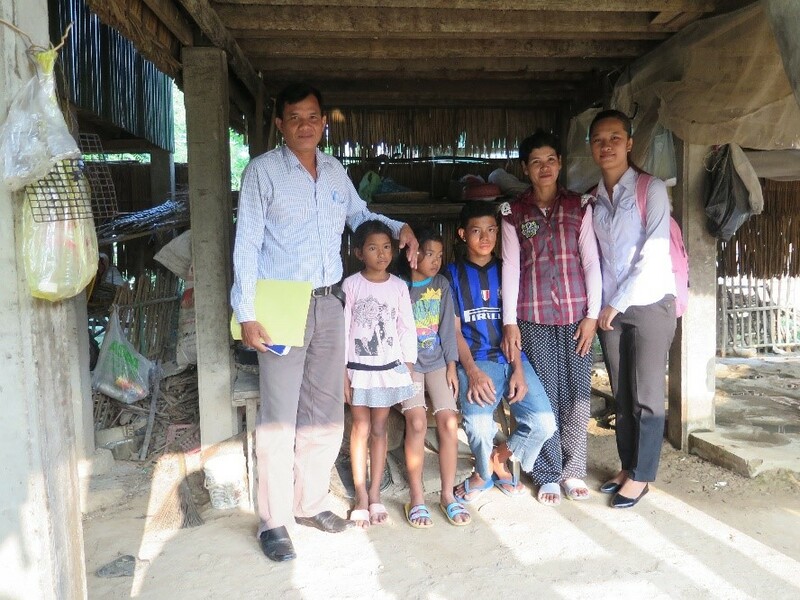 In Preah Vihear province, located in the north eastern part of Cambodia, a district leader, a community representative and a local entrepreneur have joined forces to raise the standards of living within their community. From building affordable toilets to creating awareness about hygienic practices, these three members of the Thmey commune are committed to improving the health of their neighbours, especially children. Mr. Chorn Vanna, 37 years old, is a local entrepreneur from Preah Vihear who is running a successful business building affordable toilets for his community. He grew up watching his father doing construction work and learned to build septic tanks and toilets at an early age. People in his commune had no access to toilets and would practice open defecation regularly. That’s why in 2005 he decided to launch his business with the hopes of improving the quality of life of his commune members and his family. 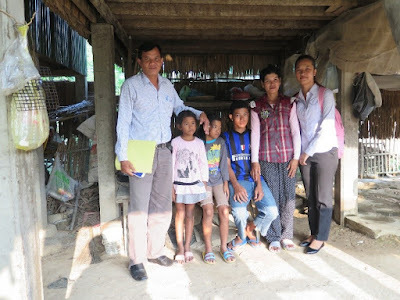 Ms. Soun Mich, 40, is a widow with three children: Dam Vandav, 16, and twins Dam Srey Pich and Dam Srey Pov, 10. Ms. Mich lives in Kor village, Krang Yav commune, Sa Ang district, Kandal province. Some years ago, extreme poverty drove Ms. Mich to place her three children in the ‘Center Amitié Khmero Franco Hong Roise’, a residential care facility. In 2006, Ms. Mich had no job, no way to generate income, no land for farming, no house, and an insurmountable debt of 2 million Riel (US$500). Her situation was made worse by continued domestic conflict with her husband, who later left her for a new woman. Ms. Mich had to bear responsibility for the family, and hoped that sending her three children to the orphanage would lighten her load. At around 2 P.M., Sorya* is woken from his nap by his foster mother; it’s time for his afternoon snack. He’s fuzzy at first, but once he hears his foster mother’s soothing voice he smiles, and starts feeding from his baby bottle. Sorya loves food, especially fried vegetables and pumpkin soup. Although only three years old, he has already experienced much hardship. Sorya was born with cerebral palsy and due to his parents’ lack of confidence in their capacity to care for him, he was abandoned at Angkor Hospital for Children when he was around nine months old. Because of his condition, Sorya is unable to walk, speak, see or do the things other children his age can do. He has been under the care of Ms. Kim Sareth and her husband for about two years. Sour Kong commune is in a remote area of Kampong Cham Province. Until recently, its population of 11,193 relied solely on tube wells and the nearby Mekong River for fresh water. 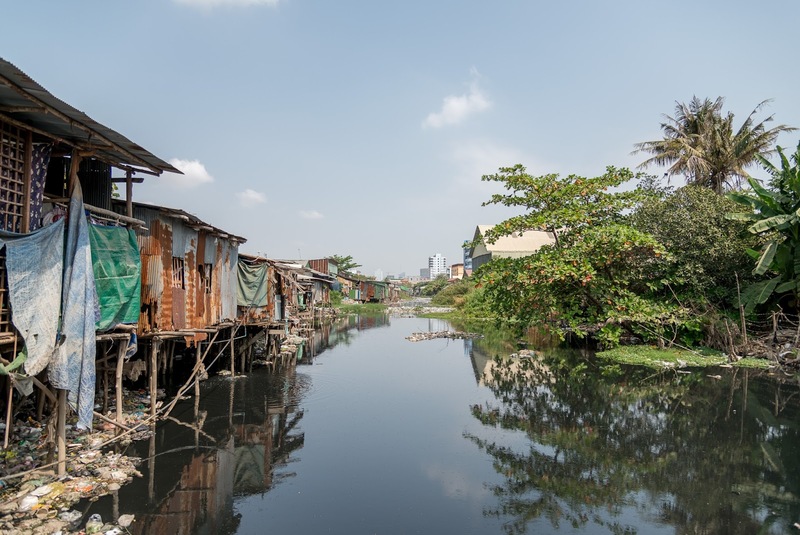 Using these sources put the health of its population at great risk: well water in this region is at high risk of arsenic contamination, while the river water, which is consumed untreated, is full of microbes, leading to diarrhoeal-related illnesses. Through arsenic testing and educational activities, UNICEF and the Provincial Department of Rural Development engaged Sour Kong to understand the risks of its water practices, helping the Commune Council to realize the importance of generating and consuming safe water. The commune was then approached by the provincial department and local WASH NGO Teuk Saat 1001 to facilitate the installation of a new water treatment system that would bottle treated local water, part of AEON-funded UNICEF activities in this arsenic-risk area. Local officials, now aware of the benefits such a system could bring, contributed land for the plant and later recruited entrepreneurs and operators to run the system. “Please send your three- to five-year-old children and grandchildren to preschool!” La Phat, the focal point for women and children in Bour commune, enthusiastically told the group of parents and grandparents seated in the classroom. About 20 caregivers had gathered at the Anlong Krouch Primary School to learn about the importance of preschool, many accompanied by their children or grandchildren. They listened closely to La’s words, not only for themselves but also for neighbours and family members who could not attend that day as they were busy working in the nearby cassava fields.